Location: L-plan arcade with entrances in Castle Street (opposite entrance to Castle) and High Street (opposite High Street Arcade). Entrance block in Dutch Renaissance style. Painted front of three storeys plus attic in shaped gable with pinnacles. Two casement windows to attic. Four window front articulated by pilasters; casement windows with elliptical heads. On ground floor, below fascia, entrance to arcade flanked by shops. (Numbering of arcade shops begins at High Street). Roof of single span with glazed infill; wood framework with scalloped edges. 2 and 3 storeys with galleried arcades of wood with 2nd floor overhanging. L-shaped east-west wing running from High Street (with nos 2-18 (even) on North Side and nos 1-25 (odd) on South side). Joined by North-south wing running into Castle Street (with nos 20 to 44 (even) on east side and nos 25 to 49 (odd) on west side). East-west wing (see above) and North-south wing to south of no 35 of three storeys. 2nd storey windows of differing widths, with upper parts of lights round-headed; flanked by pilasters. 2nd floor overhangs, supported on wooden brackets. Ground floor projects forward also surmounted by wood balustrade; shop fronts. East-west wing with 2 foot bridges at first floor level with ironwork balustrade decorated with an ivy leaf motif. East end of arcade marked by a tall rectangular panel with glazing bars and set within a round-headed arch. In north-south wing and level with no 35, a footbridge. To north of no 35, arcade of 2 storeys only with wooden oriel windows on first floor (6 on west side and 7 on east). North wall of arcade with 2 sash windows with glazing bars on first floor and a round-headed sash window just below apex of roof. 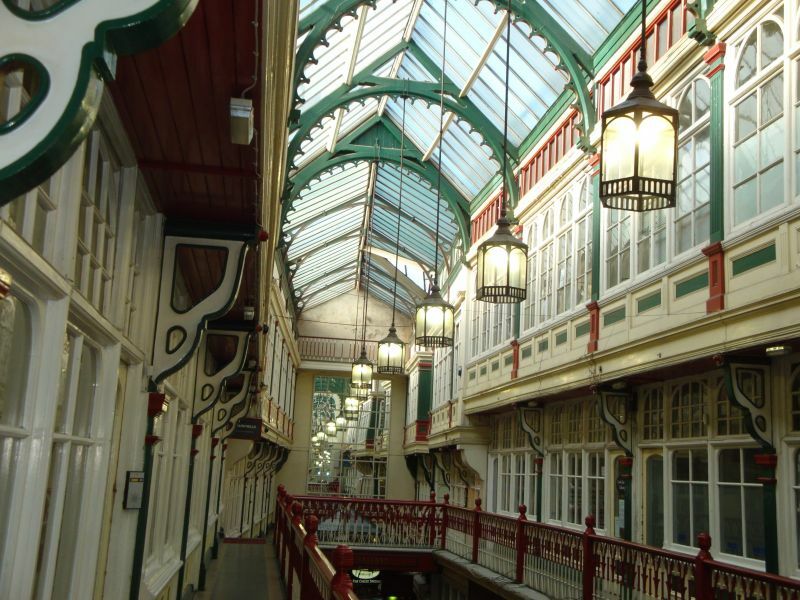 Graded II* as finest of Cardiff's Victorian arcades. To right (N) of entrance block of Castle Arcade. Attached to R of Lloyd's Bank. About 40m south of junction with Castle Street. Near N end of Street: detached to R, with No 3 stepped up to L.
Almost opposite entrance of High Street Arcade. Almost opposite entrance to Cardiff Castle. Attached to L (south) of entrance block of Castle Arcade.